Stress Management Skills Training Course Workbook Exercises and techniques to manage stress and anxiety. Build success in your life by goal setting, relaxation and changing thinking with NLP (Skills Training Course) Published by: Universe of Learning Ltd, reg number 6485477, Lancashire, UK www.UoLearn.com, [email protected] Copyright © 2010 by Kathryn Critchley. The moral right of this author has been asserted. First published 2010. All rights reserved. No part of this book may be reproduced either electronically or on paper without permission in writing from the publisher, except for passages of less than 500 words for purposes of review. ISBN: 978-1-84937-044-8 Other editions: Printed book: 978-1-84937-002-8 ebook pdf format 978-1-84937-026-4 Skills Training Course, Universe of Learning and UoLearn are trademarks of Universe of Learning Ltd. Photographs by various artists, © www.fotolia.com Cover photo © Andres Rodriguez, www.fotolia.com The publisher and author assume no liability for any loss or damage, personal or otherwise, which is directly or indirectly caused by the application of any of the contents of this book. Dedication I dedicate this book to my parents, Margaret and James Critchley Who are the two most precious people on this earth to me. They have always encouraged me, given me great confidence in myself, shown me a better path than they were blessed with, picked me up, dusted me down and pointed me in the right direction many, many times and loved me with the deepest love. Thank you for always being there and for helping to create the person I have become. I love you both with all my heart and will be eternally grateful for all you have done for me. I thank my friends and family, especially my brother Drew, Uncle Chris, Mark, Sam, Liz, Simon and Sal who have encouraged and loved me, been patient with me and supported me during good times and bad. Also to Ollie who has been my faithful pal for the past 12 years, he’s like my little guardian angel and is the best and most faithful friend anyone could be blessed with. A heartfelt thanks to you all. Special thanks to: Jane Howitt for being a part of the initial process and her great encouragement. Margaret Greenhall for her efforts, ideas and inspiration. Sally Hayes and Dave Smith for their wonderful photographs. A toolbox of ideas to help you manage your stress and anxiety. About the author: Kathryn Critchley, ReaLife Ltd With over 14 years’ experience of high-pressure sales and management roles in the telecoms industry with organisations such as BT and Orange and over 6 years’ experience working for the NHS, Kathryn understands the dynamics of team-building, change management, employee motivation and organisational productivity. She has provided training, coaching or therapy for organisations such as the NHS, Victim Support and Witness Service, Cisco Systems, Peugeot, British Gas, IBM, Royal Sun Alliance, various councils, schools and universities, and is also a trainer with the CIPD. Kathryn is passionate about helping people make positive changes and achieve their goals. She achieves remarkable results through seminars and workshops, as well as one to one interventions. She has over 12 years’ experience as a coach, therapist and trainer and a wide range of qualifications, including: Dip Counselling, Master NLP Practitioner, INLPTA NLP Master Practitioner, Cert Hypnotherapy, Dip Hypnotherapy, Hypnotherapy Master Practitioner, Graduate Anthony Robbins Mastery University, Dip Stress Management, Cert Advanced Transactional Analysis, Cert Corporate Consulting, Cert Life Coaching, Dip Performance Coaching, Cert Advanced Life Coaching, Cert NLP Life Coaching. She has also written Coaching Skills Training Course, see www.UoLearn.com and her website is www.realifeltd.co.uk In this book she shares some of the knowledge and skills that have helped her to manage her own stress and empowered others to do the same. Exercise: Stress I want to change List below the things that cause you stress and that you want to change during this course. They can be any area of your life – at work or at home. Refer back to this list in one month’s time to see if you’re making effective changes and applying what you’ve learnt during this course. Personal stressors Exercise: Which personal stressors describe you best? How do they contribute to your stress levels? Stress versus Performance Exercise: Where am I on the stress curve? How stressed do you feel (1 to 10)? How happy you feel (1 to 10)? Are you enjoying How effectively what you’re doing? are you working (1 to 10)? How stressful was it (1 to 10)? How did I handle Did I tackle the it, was it the cause or the right thing to symptom? do? Signs and Symptoms of Stress Exercise: Add your own specific behavioural changes. Exercise: Add your own specific performance changes. Exercise: Add your own specific physical changes. Exercise: Add your own specific emotional changes. Too little stress can be as bad as too much. I ensure I regularly eat a balanced healthy diet. I play a sport at least once a week. I have control over what happens to me and my life. I find it easier to face difficulties than to avoid them. I hardly ever drink alcohol or don’t drink at all. I generally manage my time well. We all need some level of stress to function properly. I’m always prepared to give my opinion on something. I know what is important to me in my life. My plans often work out, but if not I have a plan B. I get good ideas and action them ensuring they happen. I am able to ask for help when I need it. I take time to relax at least once per week. I avoid words like should/ought and must. I am in good health and happy with myself. I remember to breathe properly during times of stress. I don’t let fear of failure hold me back. I expand my comfort zone regularly by doing new things. The purpose of life is to be happy. I have goals and dreams. I believe that anything is possible. I always use the stairs instead of a lift. I eat regular meals and healthy snacks. I understand sometimes life can be challenging. I take supplements during times of stress. When I’m angry I say so and find a rational solution. Some people can cope with more stress than others. I walk as often as I can. We can train ourselves to cope with more stress. I do regular exercise. I don’t drink more than one cup of tea/coffee per day. I know I won’t always be liked by everyone and that’s okay. I find it easy to sleep and have a good and regular sleep pattern. I don’t feel the need to be perfect at everything I do. When things go wrong I consider what else I can do to resolve the situation. I can start conversations with strangers. I find saying ‘thank you’ easy when given a compliment. I can express my feelings to others. I can give compliments without feeling embarrassed. I am generally a positive thinker. I can say no and not feel guilty. I think it is more important to make a decision than make none at all. I run/walk/jog at least one mile three times a week. I feel it’s up to me to make things happen. I drink around two litres of water per day. I am good at thinking of alternative solutions. I weigh up the advantages/disadvantages of choices. I take responsibility for outcomes of my choices. I can always find time for myself as well as others. I have a good work-life balance and maintain it. I believe in being organised. I enjoy receiving compliments. I read inspiring books. We all need some stress, stress can be good. I do not smoke. I consider many ways to view an issue or problem. I challenge my negative thoughts. Stress can be a great motivator. Stress can lead to serious illnesses if not managed. Score Evaluation Score 1 point for every TRUE you chose. Score 45 to 60: You are very skilled at managing stress and pressure. You are unlikely to suffer with stress related fatigue or illness if you continue to manage your stress in this way. You are looking after your physical and mental health by exercising regularly and keeping a positive outlook therefore looking after your body and mind which will keep you strong during times of stress. You understand the need for managing stress and regularly practise techniques and strategies to maintain a healthy life balance. Remember to maintain this during any times of prolonged stress to ensure you keep a healthy balance. Score 30 to 45: You have some good skills and practise coping techniques, most of the time, but perhaps don’t fully apply them under times of intense or prolonged stress. Ensure you use more stress management strategies and techniques when pressure is exceptionally high or you may be prone to slipping into the stress trap. You need to go back to what you know and what works for you and remember to practise the basics so they become a habit and automatic, whatever the level of stress. Focus on building health and strength for your body as well as for your mind. Score 15 to 30: You probably know what you’re supposed to be doing and have some good coping skills yet you don’t always apply them. You may need to eat more healthily and exercise more plus include some good stress management strategies and relaxation into your life or you may be prone to stress, fatigue and illness. When stress occurs in your life you may not currently be as well equipped as other people to deal with it. You need to revise your strategies and implement more techniques or you may suffer unnecessary stress. Score 0 to 15: You do not cope with stress well and do not follow or even know many stress management strategies. It is possible you do not understand the benefit of good physical health, hydration and nutrition as great stress busters. You need to make some rapid changes to ensure you don’t become stressed or suffer from any of the stress symptoms. Are you nearly always punctual for appointments? Do you communicate better with your co-workers than with your partner or friends? Are you better able to relax on Saturday mornings than on Sunday evenings? Are you more comfortable when you are idle than productive? Do you carefully organise your hobbies? Are you usually annoyed when kept waiting? Are most of your recreational activities with work colleagues? Do your partner or friends think of you as an easy-going person? Do certain work colleagues make you feel aggressive? In sport are you always trying to improve and win more often? When under pressure, do you still take the extra time to make sure you have all the facts before making a decision? Do you usually plan every step of the itinerary of a trip in advance and tend to become uncomfortable if plans have to change? Do you enjoy small talk at a drinks party? Do you tend to substitute your work for close personal relationships or could it be a way of avoiding them? Are most of your friends in the same line of work? Do you take work to bed with you when you are ill? Is most of your reading work-related? Do you work late more often than your peers? Do you talk ‘shop’ over drinks on social occasions? Do you become restless on holiday? Managing your Mental State Compounding and Filtering Exercise: How do YOU compound and filter? What do you generally say to people when they ask how you are? Are the people you choose to be around generally very positive or negative in their views? Are your emails/text generally positive or negative? Do you normally smile, frown or ignore eye contact with people? If someone were to look at you and your facial expression (generally) what mood would they guess you were in? Positive Thinking Exercise: Try this experiment: Write a current issue or problem you have (choose a small one to start with!). Now being totally POSITIVE consider how you could look at this problem differently. Write down why you need to solve this problem and what you’ll gain from it. Now look at the problem, at the reason you wanted to solve it, the benefit of solving it and the list of suggestions you have. Write down honestly how you feel right now. Now being totally NEGATIVE consider how you can’t solve this problem. Write down why you can’t and won’t solve this problem and what pain and loss it causes you by not solving it. Write down three reasons why you cannot solve it. Now look at the problem, at the pain and loss of having it and the list of reasons you have that you can’t solve it. Write down honestly how you feel right now. Did you feel sad, hopeless, in pain, suffering, stuck, lost, depressed, down, angry, resentful, bitter or another negative emotion at the end of the NEGATIVE thoughts? Did you feel hopeful, thoughtful, challenged, motivated, calmer, happier, determined or another positive emotion at the end of writing the POSITIVE thoughts? You should have noticed a distinct difference in your physiology, how you felt emotionally and what you thought for each one. Which task was easier? The chances are that the easier task reflects your habitual thinking style. Positive thinking makes a real and practical difference to problem-solving because: 99 It puts you in a ‘can-do’ frame of mind 99 It encourages you to believe that there are solutions – you’ve just got to find them 99 It stops you sabotaging yourself 99 It gives you more possibilities to choose from 99 It helps you think more clearly 99 It gives you the courage to try new ideas Negative thinking makes the whole process as hard as can be and encourages us to give up as soon as we hit an objection, however small. BUT . . . Negative thinking patterns are only habits we’ve built up over the years and it is possible to change. As we’ve already discussed during compounding and filtering – we create our own reality. Choose a good one!!! Are you a negative thinker? The first step is to be aware of your thoughts so you can identify the kind of things you say to yourself. This may be difficult at first, but with practise you will soon become skilled at noticing the negative things you say to yourself (your inner dialogue). Some of the following questions can help you to identify whether your thoughts are negative and assist you in challenging them. Do I call myself negative names? Do I predict the future negatively? Do I compare myself negatively to others? Do I make things out to be worse than they really are? Do I use words like never, should, ought, must, always, every? Do I pretend or make assumptions that I can read other people’s minds by thinking this? Do I concentrate on my weaknesses and forget my strengths? Do I blame myself for something that is not my fault? Do I expect myself to be perfect? What is the evidence for or against the truth of your thought? What would other people think in a similar situation? Does this thought help me to get what I want? How would I see someone else in my situation? How would I have seen this situation before I became stressed about it? The only person in the world we can change is ourselves Our influence comes from within ourselves If we do what we have always done we will get what we have always got Each person is unique and it is important to respect that difference Everyone makes the best choice available to them at the time they make it We have all the resources we will ever need within ourselves right now Mind and body are one and each influences the state of each other There is a solution to every problem The person with the most flexibility of thinking and behaviour has the most chance of succeeding 99 There is no failure, only feedback and learning 99 The significance of our communication is not its intention but its affect Exercise: Add 3 of your own or choose 3 from the list that you will adopt as your own. Healthy eating to combat stress Healthy eating and hydration are fundamental to good health and stress management, and can make a profound difference to how you and your body cope during stressful times. Exercise: Is your diet healthy? What changes are you going to make to your diet? Physical Exercise Exercise: Exercise audit How much exercise do you currently do each week? How much do you think you could be doing? Are there opportunities for you to combine exercise with other activities, eg. walk the kids to school, climb the stairs at work? Why do you exercise? Or why don’t you currently exercise? What could motivate you to do more exercise? What forms of exercise do you enjoy doing? Over the next two weeks keep a diary of what you eat and how much exercise you take. Gradually over that time increase your exercise, practise the breathing exercises and change your food balance to more healthy food. Make one change a day. Exercise: Choose the areas you want to work on. They could be the ones with the lowest scores, or the area that is the most stressful at the moment. List the issues you’ve got with those areas and write down goals that will turn those issues around. Exercise: Your own sun diagram. Get a large piece of paper and make a sun diagram of the all the possible actions that you could take to achieve one of the goals you have selected in step 1. Step 3: Well formed outcome Exercise: Well formed outcome Work through the 21 questions with your chosen goal. Remember you can download a copy of this from the website. (www.UoLearn.com) Well formed outcome: 1. State the goal or desired outcome positively. 2. Is it specific or could you define it more, is it measurable? 3. Can you achieve it by yourself? 4. Is the goal positive and ethical to benefit you or others around you i.e. does it have a positive intention? 5. How will you know when you have it? How will you feel? 6. Why don’t you have it now? Has anything stopped you? 7. How big a goal is it? Do you need to break it into smaller goals? 8. What are all the steps you need to take? 9. When will you take the first step? 10. When will you complete it all? 11. Are there any other ways to get it? 12. What resources do you currently have (physical, emotional, mental, spiritual, financial, knowledge, skills, assistance etc.)? 13. What resources will you need? 14. What will you need to give up to have it? How will it affect you (friends, work, relationships, lifestyle)? 15. What will happen if you don’t get it? How will you feel? 16. What will happen if you do get it? How will you feel? 17. If you don’t get it, will you lose out on anything? 18. If you do get it, will you lose out anything? 19. What will having it give to you? For what purpose do you want it? 20. Will achieving this goal enhance your life and/or others around you? 21. Is it a worthwhile goal to aim to achieve? Do you still want to achieve this goal? If you’re happy with this goal, you can now continue to the goal setting process. 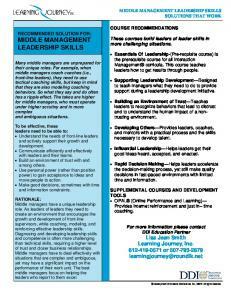 Report "Stress Management Skills Training Course Workbook"